The second leaflet in the series The Church: Our house of worship, Our house of God is now available. 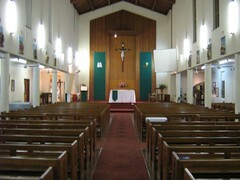 This leaflet in the series looks at the space in the church for the assembly. Remember also that you can access the whole series of brochures as they become available from The Church page on the Liturgy Committee website. Next Next post: 19/8/07 – God’s House, or Ours?